Ong (centre), flanked by Ng (left) and Andre, pose with the young participants at Dewan Stampark on Thursday. KUCHING: The Kuching Badminton Association (KBA), held a two-day youth camp which concluded at their training centre at Stampark Badminton Hall on Thursday. A total of 110 participants aged between 8 and 14 received certificates from CEO of Sarawak Sports Corporation (SSC) and Director of Sarawak State Sports Council (MSNS) Dr Ong Kong Swee at Dewan Stampark, BDC. 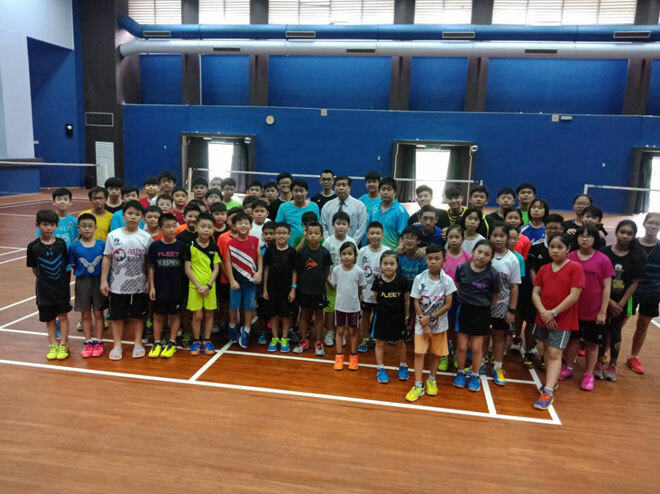 KBA head coach and youth development coach Johnny Ng, who is also an Instructor in the Badminton Association of Malaysia (BAM) Coaching Education Panel, mentioned that this is the first time that KBA have organised this youth camp and that it will continue to do this during every school holiday period. He also thanked SSC for supporting their event. During the closing ceremony, Ong encouraged parents to send their children to take part in these kind of sports activities. “Through time, there will be a large pool of young talented athletes. Talent scouting will be conducted frequently by the relevant authorities of each sport so that they can be further trained under the corporation’s programmes,” he said. Ong added SSC will support these nature of activities. Also assisting in the youth camp was MSNS Elite Centre coach Andre Wijaya.